Mary Jane Swenson considers the quilts she makes to be more than art. She also considers them her ministry. According to Swenson her quilts are not just ordinary bits of cloth sewn together. Because they represent what is holy, they are holy. Mary Jane Swenson, who lives in Paynesville Township, considers her quilts as her ministry. She uses religious symbols to depict Bible scenes or illustrate Bible verses. The quilt here represents the birth of Christ. Depending heavily on the use of icons - symbols from the church that represent religious themes - many of the quilts depict religious stories. 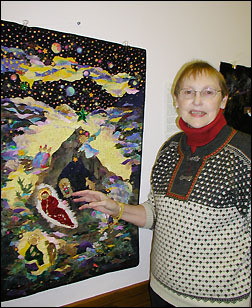 She has made quilts to illustrate the creation, the birth and death of Christ, and quilts that illustrate some of her favorite Bible verses. When people admire her quilts, she wants them to see more than pieces of fabric sewn together. "I want viewers to pause a while and meditate on Jesus," she said. "I quilt using my fabric as my paint, and the sewing machine as my brush," said Swenson. Swenson, a native of Spicer who now lives in Paynesville Township, began quilting about 10 years ago when she was asked to make some altar cloths for her church. In all, Swenson has finished about 20 quilts of various sizes. Some of them hang on her own walls, some belong to family members, and many are displayed by her church during services. Recently her quilts hung at Peace Lutheran Church in New London for a show. Swenson has never sold a quilt, but eventually she would like to do commissioned quilts. Her first quilts were very traditional with a lot of symbols. Finding that she didn't like to piece quilt squares or follow patterns, she began letting her hands follow her "mind's eye." Combining art and religion, Mary Jane Swenson rarely has a plan when she starts a quilt. Instead she relies on God to guide her. 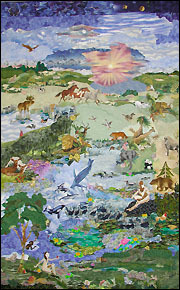 This quilt represents to birth and creation of man. Even though she keeps a notebook full of Bible verses, sketches, and ideas, she rarely has a plan when she begins a quilt. Each piece evolves and creates itself, she said. Starting with bare cloth, Swenson uses fabric, beads, glittered threads, and other objects to tell a story. Using fabrics with patterns, she may move the quilt parts dozens of times before she bastes each one to the background. Striking a balance can be difficult, she said. Because she uses so many patterns, sometimes it is hard to make sure a quilt doesn't get too busy. The only thing repeated in her quilts is the sky. Although it may look different in each quilt, Swenson has incorporated the symbol of the creation - a sky with stars and swirling clouds - in many of her quilts. Mary Jane Swenson relies on icons to help tell Biblical stories with her quilts. 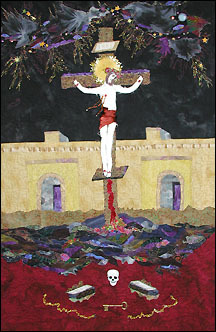 In this quilt, which illustrates the death of Christ, the skull represents Adam at the foot of the cross, the keys represent Christ who opened the locks of sin, and the broken chains represent the chains of death that were broken by Christ. Some of her symbols are obvious: the baby in the manger representing the Christ child or Christ on the cross for instance. Others are not so obvious: a key attached to one quilt represents Christ who opened the locks of sin and a skull represents Adam at the foot of the cross. Using the Internet and other sources, Swenson does extensive research into each of the symbols before using one in a quilt. She believes she is guided by God as she works on each piece and she has even experienced some mystical moments while working on quilts. Sometimes, while handling the icons - the fabric Mary made of red velvet to represent the blood of childbirth, for instance - Swenson feels the presence of Christ and His suffering, she said. While her early quilts were hand quilted, because of problems with her hands she now does all of her quilting by machine. She doesn't use a template or a guide for the quilted patterns either. Instead, the pattern emerges as she feeds the layers of fabric through the machine. Besides quilting, Swenson also dabbles in photography and loves to garden. Both her photography and her gardening reflect her love for quilts. "I garden like I quilt," Swenson laughed. Never beginning a garden project with a plan, she starts out with a blank slate, in this case soil, and then moves plants about until they please her. preparing for a photography show, Swenson noticed that many of her photos were also arranged in quilt-like collages.